A handsome Tudor pub-with-rooms option, just off Junction 9 of the M20. Comfortable, affordable and boasting a first class Italian Restaurant. 16 en-suite guest rooms with facilities including TV, Refreshments and Wi-Fi. The Croft Hotels offers a cheerful, friendly atmosphere and some truly outstanding views. Ashford Golf Club is just 10 minutes up the road and Eastwell Lake is within trekking distance. Some of the most wonderful gardens and historical attractions can be found nearby including Leeds Castle, Canterbury Cathedral and Sissinghurst Gardens. The 23 bedrooms are fairly standard. They're nothing exceptional by any means, but they're clean, comfortable and come equipped with FREE WI-FI. The hotel lounge and the bar have a cosy, laid-back atmosphere and there is a well-conceived menu with lots of tasty home cooked food on offer. The La Dolce Vita, is the hotel's Italian Restaurant and sits in two acres of pleasant landscaped gardens. 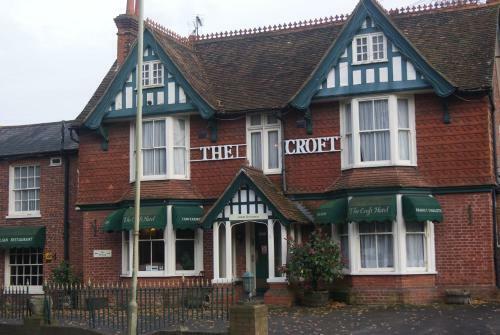 The Croft Hotel is just 15 minutes away from the eurotunel, 20 minutes from Dover and 5 minutes by car from Ashford International train station.